Solar Water Heaters are a simple and cost effective way of harnessing the sun's free energy. Solar hot water systems supply an average 80-90% of a household's annual water heating needs. A solar hot water system is the best choice and a smart investment that you can make for your house or comercial proberty and for the environment. Homeowners and comercial businesses can easily take advantage of the sun's energy with the installation of a Solar Water heater from World Wholesale Bahamas. Using solar energy to heat your water provides your home with many advantages including reducing energy bills, increasing the property value of your home and helping the environment. To find out more of the benefits and features that a solar water heater can give your home or business, please call us for your FREE evaluation and estimate. 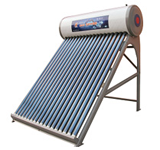 The Solar Water Heaters we sell at World Wholesale Bahamas are part of our overall solar and energy saving program. Our goal is to help all homeowners and comercial buisness in the Bahamas save money on their energy costs and to help out the environment. Installing a Solar Water Heater from World Wholesale Bahamas is quick and easy. A certified solar water heater installer will come to your home, and make all of the necessary connections so you can start saving money right away!